That unlikely and utopian science fiction anthology project I blogged about last June? Well, exactly six months later, on December 22, I released it – and it’s doing quite well! Defiant, She Advanced is ten stories of defiance and daring. Here is the blurb. From the Imperium-controlled aetherlanes to a tech noir restitution agency in the Free Zone and from a steampunk, 1894 China with clockwork automatons to a post-1984 Orwellian dystopia with mandatory goodpharm, here are ten science fiction stories of defiance and daring. Split evenly between strong female and male leads, these heroes fight losing battles on principle alone, discover lies hidden deep inside themselves, execute daring rescues and fight for love and liberty in a society where human dignity is cheaper than obsolete swarmbots. These original, never-before-published works are from veteran authors, including William F. Wu, as well as emerging talents. We raised $262 with a crowdfunding campaign. Our Reddit AMA was well-attended, as was a Facebook launch party, both on December 19. On January 12, co-authors Wendy McElroy, J.P. Medved and I had a great chat with Liberty.me’s Mike Reid. This kind of event is usually only for Liberty.me members but they made an exception for us. Here is the video. 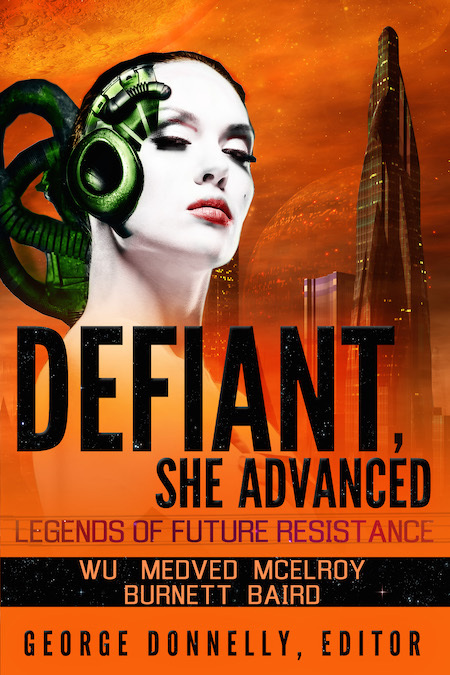 You can get more information about Defiant, She Advanced, including story summaries, author bios and a free sampler, at GeorgeDonnelly.com/Defiant.